Batcave Toy Room - Better Living Through Toy Collecting: "Toy Hunter" Returrns Tonight, But Did Anyone Watch "Collection Intervention?" "Toy Hunter" Returrns Tonight, But Did Anyone Watch "Collection Intervention?" I am looking forward to the return of Toy Hunter tonight. I enjoyed the pilot and really went into fantasy mode imagining myself being just like toy collector Jordan Hembrough. Turning my hobby into a business and going on the hunt for vintage toys. I was also excited that there is actually a series that relates to us toy collectors, but wait! Another one comes. NEW YORK – July 25, 2012 – In Syfy’s newest reality series, Collection Intervention, premiering Tuesday, August 14 at 10PM (ET/PT), former Head of Special Collections at Christie’s Elyse Luray helps couples, families and individuals whose pop-culture memorabilia collections – from Star Wars and Battlestar Galactica to Catwoman and Barbie – have become damaging obsessions, creating financial strife and a huge strain on their lives. 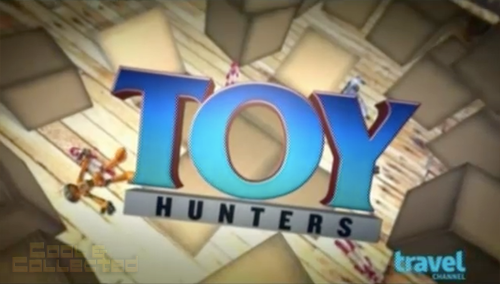 Looking forward to Toy Hunter but passed on the other show. Me too, but I recommend at least checking out Collection Intervention and giving it a chance. I hate not knowing about cool shows like this one. I can only hope to catch a repeat or hope that it's on On Demand at some point. Check Hulu, but it is on the SYFY Channel on Wednesdays at 10:00. It was on On Demand, so I got to see it before I watched Toy Hunters. Loved it. Scary though. I hope I never wind up like that. I checked them both out and will continue to do so every week. Just catching a glimpse or two of some great items makes these shows worthwhile. Toy Hunter is absolutely living the dream! I watched both of these and screemed at the TV when the dealer lowballed the guy with all the great Six Million Dollar Man sets. Those boxes didn't look so bad to me. As I said on my blog. I SAW that Oscar Goldman figure on the table and I would have killed everyone including the camera man to get it. I like these shows but I wish they didn't make the guys who buy and sell the toys to be such dickheads. As a toy collector I would not want any of them as my friends. As a collector and seller of toys myself I guess I get it. The dealers are in it to make a profit and collectors hope to find a holy grail cheap. However, most people don't realize there are other means to sell their toys, which means I need to do a post about selling toys and not getting fleeced.